Despite no world records, the 85s was one of the most surprising and intense classes yet. No one could have predicted the extraordinary successes and upsets, as well as the disasters. I knew that Ara Khachatryan of Armenia and China’s Lu Yong would be coming in strong, even though I had seen Yong having some knee issues in training the other day. But I had no idea the field would be so ridiculously stacked. 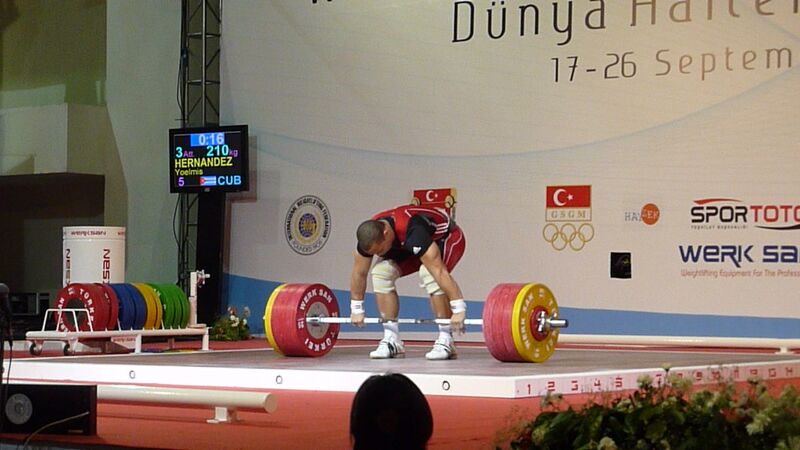 Even the B session was solid, with Yoelmis Hernandez of Cuba going 6 for 6 with 164 and a 210 clean and jerk. As good as that performance was, by the end of the A session it was only enough for fourth. 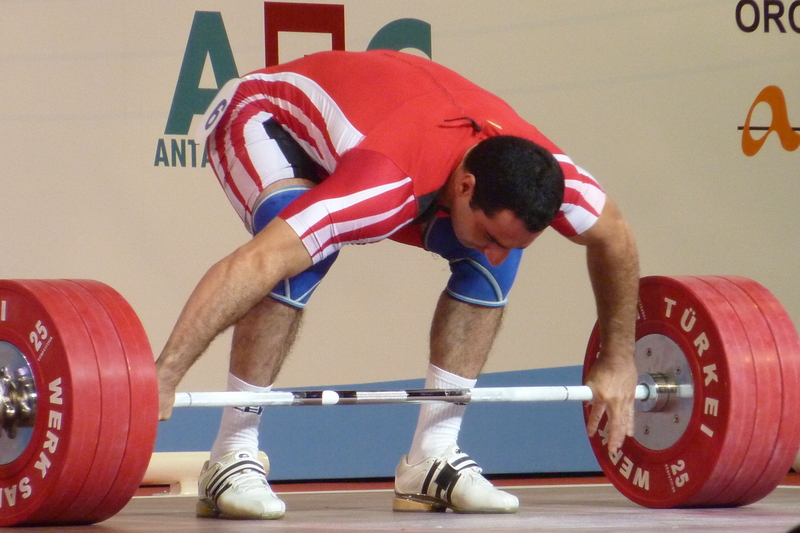 Four guys in the A sessions snatched 170 or more, including a monstrous 175 by Ara Khachatryan, who came back to make it on a third attempt after missing it on his second. 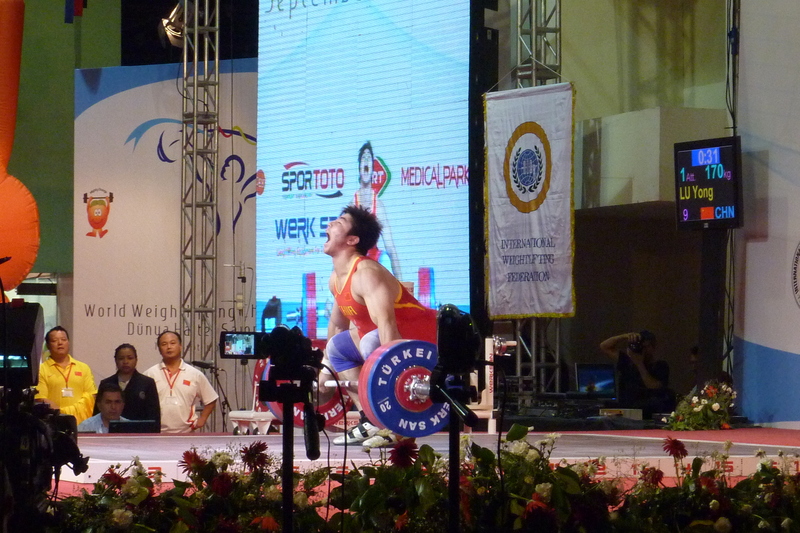 Lu Yong, surprisingly, was only able to do his opener at 170, missing 175 on his next two attempts. 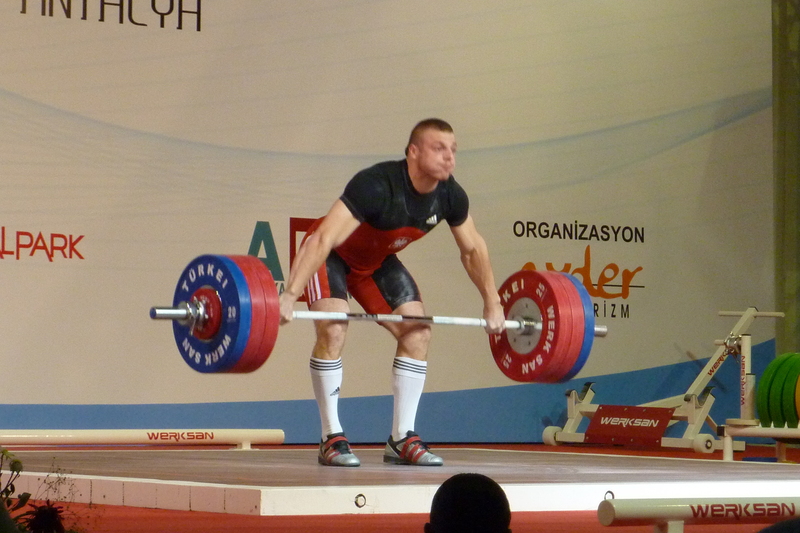 Aleksey Yufkin of Russia, up from the 77s, and Adrian Zielinski of Poland, managed 172 and 173, respectively. The clean and jerk portion of the competition was just as intense and crazy. Korea’s Kwang-Hoon Kim brought the bar to 200, making it on his second shot at it, and then Ara Khachatryan raised it to 201, which would have firmly established an initial lead and a mark for the others. Unfortunately, disaster struck, and just as he got the weight locked out overhead his right elbow gave out. An awful thing to see happen for any number of reasons. The loaders were on the platform within seconds, blocking the awful scene, and a few minutes later Khachatryan was carried off. The mood and energy of the place following the incident was totally different. Tense. Stunned. Nervous. The previously boisterous Armenians were now silent, although there was respectful applause at the end. 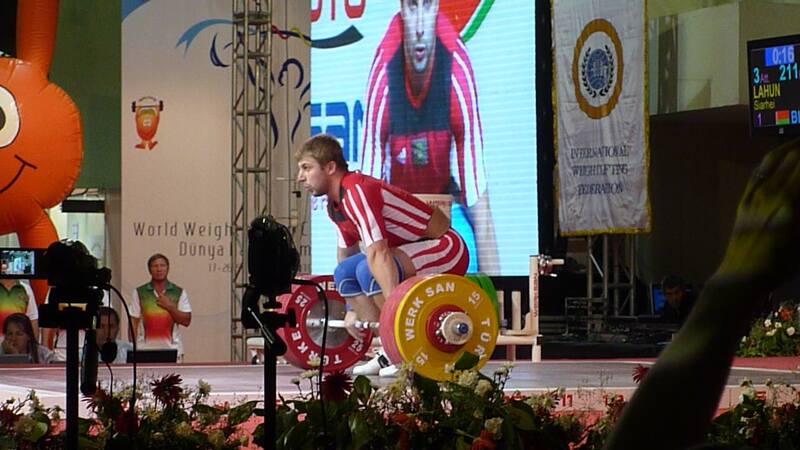 But the competition must go on, and after the clock ran down on Khachatryan’s third attempt the lifting continued. And despite the horrible specter of serious injury hanging over the place, the remaining athletes came out for some big lifts and a serious fight for first place. Lu Yong opened with 202, though his careful hobble offstage was cause for concern. Yufkin made a solid 208, and then Zielinski answered with 210. But then there was confusion and chaos; Lu Yong, listed at 211, was suddenly withdrawn. The Belorussian Siarhei Lahun came up for his shot at 211, but was then told to stop. What followed was several minutes of uncertainty, with Lu Yong’s name reappearing on the board and a clock starting for him, before finally disappearing once more. That sort of thing can totally throw a lifter, and Lahun gave the 211 a good shot but missed it. 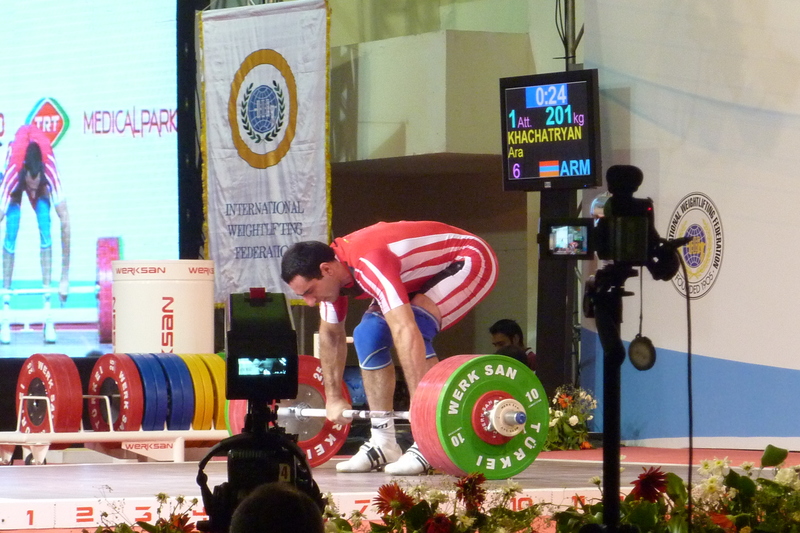 Yet to his amazing credit he came back to make the weight on his third attempt, putting him into third overall and first in the clean and jerk. Yufkin at this point needed 212 for the win. He gave it a legitimate shot, with an outstanding clean, but the jerk was just out front, leaving the win with Zeilinski. Following the 85 competition, Mark, Rachel, and I headed over to the venue hotels, Topkapi and Kremlin. Both places are Russian oases on the outskirts of Antalya, about 35 minutes from the city center. They’re located along a stretch of road that runs along Lara beach, populated with similar monuments to conspicuous consumption and excess for tourists wishing to visit Turkey without actually seeing it. There’s even a faux Doge’s palace, no doubt constructed for wealthy Russian and German businessmen wishing to fashion themselves as Venetian rulers. Kremlin is the more interesting of the two monstrosities. It’s a little slice of Soviet landscape, complete with a scaled down recreation of Red Square.Both hotels are like docked cruise ships, allowing guests the convenience of the Mediterrannean without the hassle of having to ever leave your hotel for anything except to buy cheap prescription drugs along the strip. Although who knows. They probably have an in house pharmacy somewhere, or a porter who’s more than willing to fetch whatever it is you need at two in the morning following a night of lamenting the demise of communism over bottles of Vodka. Topkapi was filled with athletes, coaches, trainers, as well as tourists probably wondering why so many burly men and women were milling around their grand oasis. The Asian and European athletes and coaches were all smoking and drinking, most still in whatever it is they wore to the venue. After hitting up the 11pm buffet we headed over to Kremlin to meet up with Armen Kazaryn, a 69 kilo Armenian who now lifts for Russia (“There is more money there”) and some of his fellow Armenians. We bumped into Ara Khachatryan, whose right arm was contained in a massive sling. But most of the night was spent in the hotel’s bar with Arman, Tigran Martitosyan (the 85 one, not the 77), Gevorg Davtyan (77), and a boxer friend of theirs. None of the lifters worked; all of them made money through lifting. Tigran, following his bronze in Beijing, received a monthly stipend of 30,000USD (can that be right? hard to tell given translation and language difficulties). Armen, by comparison, was getting around 2000 a month. Not bad money for a life spent lifting. But it was still a struggle, according to him, since he had to spend so much money on supplements. I figured that meant something serious, something exotic and Russian, probably with all sorts of strange and banned substances. But when asked what kind of supplements he said they were American. Muscle Tech? This guy was using Muscle Tech, buying it at three times the cost. I wouldn’t have believed him had he not sounded so serious about the problem of spending so much money on American supplements, and had he not named some of the products. At the bar I asked the two Armenians about their lifts. Both had done 180 and 210 in training. Impressive for any weight class, but especially so for the 77. Unfortunately both had also bombed at this competition. All of the three lifters had started when they were about ten years old.